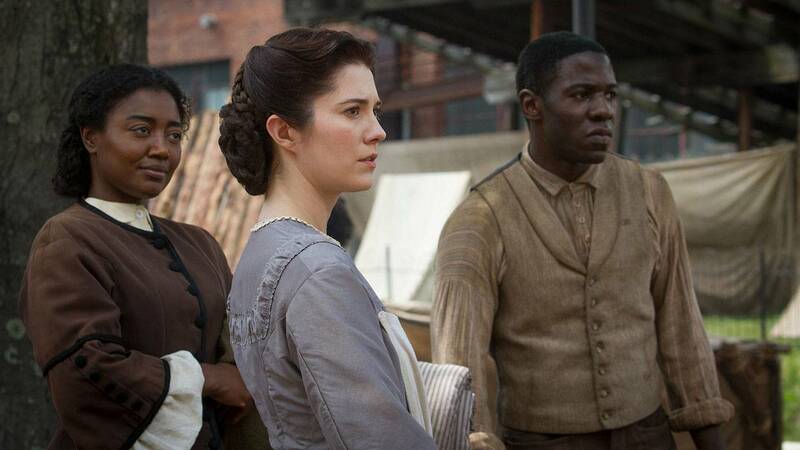 Mercy Street fans, rejoice! The show has finally returned for Season 2 with an exciting premiere promising relationship drama, family turmoil, teeth-clenching operations impossible to turn away from, and a surprising number of references to biscuits and punch. So, where exactly did we leave off? When we last visited our friends at Mansion House Hospital, they were unknowingly in danger as a radical secret society, the Knights of the Golden Circle, and a certain “dentist” by the name of Billy Griffin (a.k.a. Frank Stringfellow) were plotting the assassination of President Lincoln. Of course, because of Emma Green’s presence in the crowd welcoming President Lincoln to the hospital — and because love makes you do crazy things — Frank ended up using his entire body to extinguish an explosives fuse to protect her. Lucky for the hospital, not so lucky for Frank. 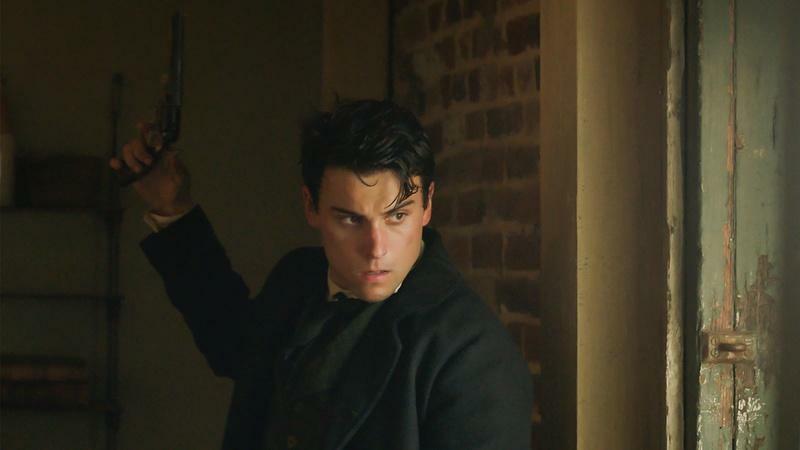 At the beginning of Season 2, Mercy Street introduces us to Allan Pinkerton, head of the Union Intelligence Service. Naturally, after discovering that there’s been a murder attempt during a visit from the President, he’s immediately on the hunt for the perpetrator, much to the dismay of a hospital staff already amidst so much chaos. Meanwhile, Dr. Hale attempts to win over Dr. Foster (now Hale’s superior). Providing some comedic relief to an otherwise unsettling sight at the operating table, the doctor is ready to prove that he can perform surgery with the best of them — without killing anyone in the process — as Silas Bullen’s life hangs in the balance. Sure, his methods might still be outdated, and he may not know the names of different suturing techniques, but alas, he manages to save the man anyway. “Excellent hands,” indeed. Congrats to all you Jed and Mary shippers (and Phinnsters)! The two are taking their relationship to the next level — what wife, where? — and Jed’s true feelings for Mary are finally surfacing… in a Shakespearean sort of way. I mean, what a line, Jed. Bravo. There’s even some handholding and — gasp — a hallway kiss. The real question is what can’t she do? While Dr. Foster and Nurse Phinney busy themselves with feelings, newcomer Charlotte Jenkins of the Freedmen Society arrives in Alexandria to provide support to the contraband camp. It doesn’t take long for her to detect a smallpox epidemic knocking at the hospital’s front door, and she takes immediate action. Alice ups her espionage game for the Knights of the Golden Circle as she delivers and receives secret messages, helps conceal Frank and embarks on a new plan that involves wooing a handsome Union Captain — Lance Van der Berg, that is. She throws out words like “passion” and suddenly has him hooked, because: men. Fearful that Mr. Bullen’s survival will blow his cover, Frank tries to kill Bullen in a second attack, this time to the neck. Clearly Frank needs to sharpen his knife skills, though. With a successful blood transfusion, a new medical procedure Foster has learned from a doctor in London, Bullen lives to see another day despite how much everyone else would love to see him gone. With Dr. Summers out of the picture and off to “Washington City” (read: D.C.), Major Clayton McBurney III makes his entrance as the new hospital chief. As if they needed one more person questioning their every move, the staff is understandably taken aback by McBurney’s somewhat colorful personality, and initial refusal to meet anyone until he has settled in. On the plus side, the nun seems to have a thing for him. Well, that was short-lived. About as fast as the romance between Jed and Mary began, it quickly fizzles out. After observing that Dr. Foster’s values didn’t quite align with her own, and that he constantly chooses to ignore the issues that exist outside of the hospital (helping the contrabands, for instance), Mary puts the relationship on pause. As Jed and Mary navigate through their on-again, off-again relationship, the Green family deals with issues of their own. Met with false support from his mother, Jimmy signs the Oath, pledging allegiance to the Union in hopes of getting his father released from prison. Whoops! Big shock (but not really): James Sr. is outraged when he discovers the news, accusing Jimmy of bringing dishonor to the family and instead praising Emma who was actually responsible for his pardon. But Jimmy won’t stand for it this time, tearfully refusing to have his father belittle him… because no one puts Jimmy in a corner. We sense some major character development here. Being the do-gooder that she is and quite possibly the only person whose life isn’t in a complete state of disarray right now, Charlotte reaches out to Samuel Diggs for his assistance with a man who has come looking for Aurelia. Plot twist: Aurelia is his wife. Suspicious of the man’s motives, however, or perhaps selfishly trying to hold onto Aurelia, Sam tells a half-truth (lies) to Charlotte with a cryptic message resulting in the side-eye above. Sorry, Sam, but you cannot fool Charlotte Jenkins. 11. What’s Wrong with Mary? From a fallout with her beau to a mysterious illness, poor Mary just can’t seem to catch a break. As the Season 2 premiere concludes, we’re left with the ultimate cliffhanger and an unsightly scene as Mary finds herself coughing blood into her handkerchief. See more from Balm in Gilead with our exclusive photo gallery.